With mum or dad in the water with bub, Waterplay has been developed as an educational program for parents wanting to introduce their baby to water for the first time. The free community program is open to babies aged two to four months old and will be led by qualified and supportive swim instructors. It's a time for parents to gain an insight into what to expect from future swimming lessons as well as gauge their child's pool readiness. Waterplay is the perfect aquatic 'play group'- an enjoyable environment for aquatic education as well as socialising with other parents. "Waterplay is an aquatic 'play group' and while the program emphasises parent education, as well as familiarising babies with water, we also encourage parents and their child to have fun together, safely and in a social environment. The program is structured around teaching parents how to gently expose their baby to water and learning to swim. 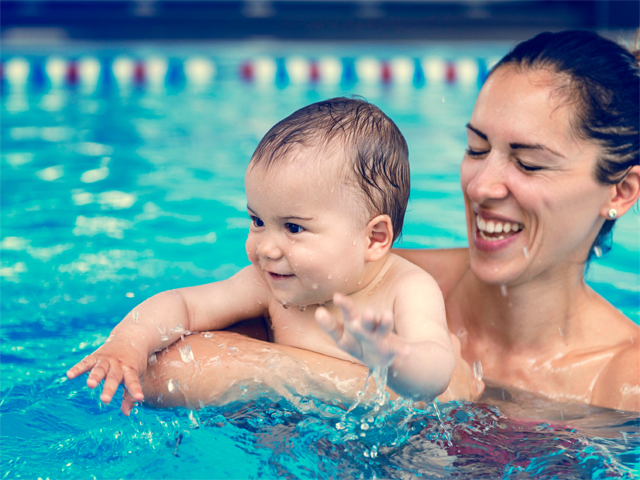 The will also learn how to safely hold a baby in water with the program teaching the three foundation holds including front hold, side and back hold – each demonstrated and practiced during the session." explains swim instructor, Nicola Sleight. Waterplay runs with one parent per baby in the water at a time, with a maximum of 16 per class. The commitment free and flexible sessions are the perfect relaxed environment ahead of formal swimming lessons. The aquatic play group will be held on Wednesday 20th Feb and Wednesday 27th Feb, for a 30 minute sessions at 12pm- a perfect mid-week activity. Two fully qualified swim instructors will lead the sessions, both dedicated to partnering with parents in the aquatic education of their child.